We started December by finishing off a few projects, but then soon moved into the Advent celebrations and gift making ready for Christmas. Mr 7 worked really hard on his December calendar and was very pleased with the result. In the first week of December, we spent time exploring the Number 7 by using the Aboriginal dreamtime story of the Rainbow Serpent. We also studied rainbows and leaned how to make our own using a glass of water, a piece of white paper and light from the sun. TL: A white lipped snake we found in the garden this week! We did further work on the 4 processes, this time learning about division. 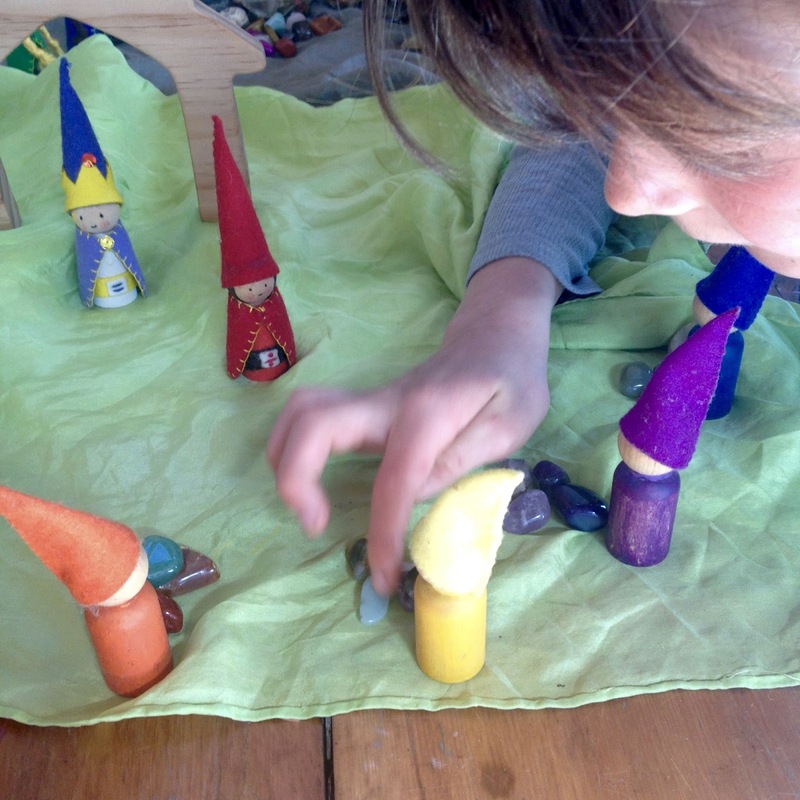 We are using the stories from 'The Gnomes Gemstones' booklet (found <here>). The rest of December was spent in preparation for Christmas. December, Summer and the celebration of Advent always seem to take on a whole life of their own, and the days leading up to Christmas are full and brimming with fun. I must remember this and plan to set aside this time next year. We got some inspiration for Advent activities from <here> and from another site which unfortunately I can seem to find again. If anyone knows, please post the link in the comments and I will post in here. Our random acts of kindness Advent Calendar was a huge success and worked so beautifully to take the focus off the 'presents for me' attitude that seems to be the focus of the Christmas season, and shifted it instead on what we can do for others. We can't wait to do this again next Advent. So for the rest of the month leading up to Christmas we spent many happy hours in the garden, bottling, preserving and jamming fruit and making homemade Christmas presents. We made paper crafts, did clay work and baked cookies. We spent time with friends and family. Here are some pics from the period leading up to Christmas and beyond. Picking berries from the garden and making jams and preserves as presents for their Grandparents, Aunts and Uncles. complete with handmade beeswax tea lights candles. BL: Christmas presents wrapping in silks under the watchful eyes of the Nutcracker guards! TC: Bush walks and a "real" troll bridge! Thank you for writing this blog. I find it so inspiring. Could you please post the random acts of kindness Advent Calendar?